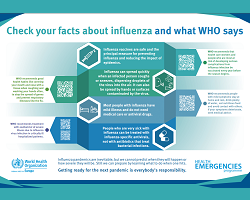 WHO/Europe and the European Centre for Disease Prevention and Control (ECDC) coordinate surveillance activities related to the prevention and control of influenza in the WHO European Region. Since 2011, the 2 institutions have jointly organized annual meetings focused on epidemiological and virological aspects of influenza surveillance, seasonal influenza vaccination, and the global situation regarding outbreaks of avian influenza and other emerging respiratory pathogens. This is the sixth Joint Annual Meeting for the 53 Member States of the Region’s influenza network. The aim of the Meeting is to discuss technical and operational issues related to influenza surveillance, seasonal influenza vaccination programmes, and risk assessment and outbreak response. Topics will be derived from work that was prioritized during previous annual meetings. Participants will discuss progress in the implementation of new surveillance systems as well as the strengths of existing systems in the light of their contribution to Flu News Europe and to influenza-season risk assessments. In addition, this year’s Meeting will reflect on 2 significant events: the centenary of the 1918 influenza pandemic and the first decade of the Region’s influenza network, which was launched in 2008. To reflect the significance of these events, the Meeting is being held at UN City in Copenhagen, Denmark. maintain and strengthen collaboration and information-sharing among network members.